Honoring our bright past; Building a bold future. It was Richard Cardinal Cushing’s dream to create a place where the children he called “exceptional” could learn, grow, thrive, and achieve their individual success. In 1947, we welcomed our first 35 students. Since then, we’ve helped more than 3,500 children and adults to discover their talents, nurture their passions, and lead remarkable lives in communities where all ages and all abilities can come together. 1947: Richard Cardinal Cushing purchases approximately 175 acres of land in Hanover, Massachusetts, to found a school for “exceptional” children. 1947: Five sisters from the Sisters of Saint Francis Of Assisi of Milwaukee, Wisconsin, noted for its expertise in working with intellectually disabled children, honor the Cardinal’s request to relocate from the Midwest in order to co-found and run St. Coletta’s by the Sea, which will be the first school of its kind in the Northeast. 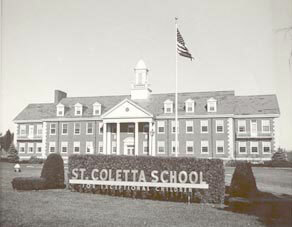 October 15, 1947: St. Coletta by the Sea in Hanover opens, providing residences and classrooms for thirty-five children. Five sisters and three employees covered all the work areas. The school program included academic studies and training in life skills. Sister Mary George Reichert is the first superintendent. 1950: Newly constructed school/administration building dedicated on November 4th. 1953: The Portiuncula Chapel, which will ultimately become the final resting place of Cardinal Cushing, is dedicated on October 31st. 1954: The Cardinal acquires one small residential home and some property abutting the Hanover campus, to allow for increased student enrollment. 1955: The Hanover campus is re-named St. Coletta School, Inc.
1956: Enrollment is up to 142 residential students and 10 day students in Hanover. The Cardinal procures a donation from the Joseph P. Kennedy Foundation for the construction of a residential dormitory on the Hanover campus. 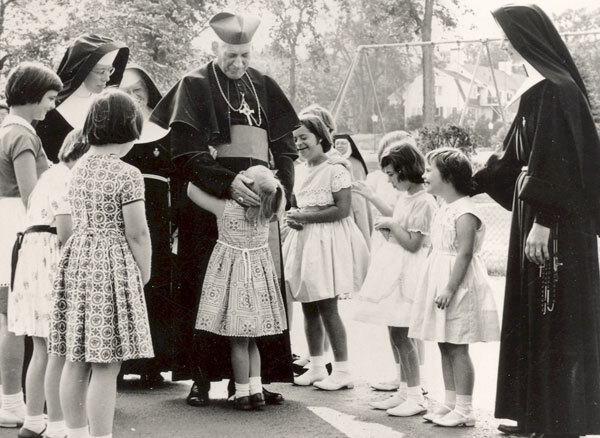 1957: The Cardinal donates approximately five acres of land in Braintree so the Sisters can open the St. Coletta Day School there. The school opened on September 5, 1957 with six students under the direction of Sister Johanna Flanagan. 1957: The dormitory on the Hanover campus is dedicated. 1958: The swimming pool and tunnel connecting the school and dormitory buildings, to protect the students during periods of bad weather, are constructed. 1967: Superintendent Sister Shawn Dunn hires John Shyne, Jr. to establish a vocational education center, operated in conjunction with the Massachusetts Rehabilitation Commission. 1970: Richard Cardinal Cushing dies, ending more than 20 years of ongoing commitment to the schools and the children they served. He is buried in the Portiuncula Chapel overlooking the Hanover campus. 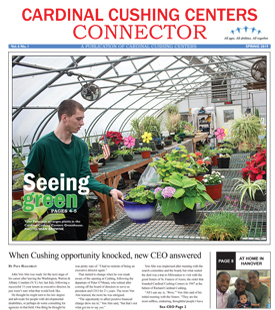 1971: The school changes its official name to the Cardinal Cushing School and Training Center in tribute to the late Cardinal and his immeasurable contributions. 1972: A 22,500-square-foot building opens on the Braintree campus to help accommodate the demand for special education programs. On the Hanover campus, a physiotherapy center is completed. 1981: Mr. Shyne receives a HUD grant to build the Cushing Residence on the Hanover campus, a facility of 148 apartments for low-income senior citizens. The seniors in time became connected to Cardinal Cushing School and Training Center, participating in bingo nights and the Iron Kettle restaurant. 1984: Mr. Shyne is appointed President and Chief Executive Officer, a position he held until 1996. 1991: Programs focused on providing residential and vocational options to individuals within the community over the age of 22 are initiated in Hanover and Weymouth. 1998: Communities of Quality Exemplary Elderly/Disabled Property Award given to Cushing Residence by the New England Affordable Housing Management Association. 2000: The umbrella organization is re-named Cardinal Cushing Centers, Inc.
2002: Community of Excellence Award in the Affordable Housing Category for Massachusetts granted to Cushing Residence by the Greater Boston Real Estate Board. 2002: The Centers announce a capital development plan to dramatically alter the delivery of residential services. 2004: 11 six-bedroom residential units, designed with the “feel” of a traditional family home, open on the Hanover campus. 2005: A 3,000-square-foot recreation center designed to host a variety of enriching activities for students, residents, and the community opens on the Hanover campus. 2010: Cushing Centers receives its first three-year certification from CARF, The Commission on Accreditation of Rehabilitation Facilities.